Watch the clock for correct critical care coding. Part B clinicians sometimes treat patients whose conditions are so critical that the visit turns into a life or death situation. There are a few potential ways to code these visits, so it’s important to know all the options before you submit your bill. “Critically ill or injured implies that there is a risk of loss-of-life or loss-of-function/further loss-of-function of a major organ or organ system, with an acute or exacerbated presentation of the condition,” explains Joshua Tepperberg, CPC, senior coding analyst at Caduceus, Inc., in Jersey City, New Jersey. The critical care service must span a cumulative time of at least 30 minutes on a given date of service; any critical service provided for less than 30 minutes should be billed with the appropriate E/M code. +99292 – ... each additional 30 minutes (List separately in addition to code for primary service). Warning: “There is an extreme need for physicians and their coding staffs to constantly work on understanding the E/M coding process, particularly the necessary supporting documentation,” says Duane C. Abbey, PhD, president of Abbey and Abbey Consultants Inc., in Ames, Iowa. Consider these E/M coding examples to avoid critical care service snafus. A patient presents to a practice for an allergy injection and has an anaphylactic reaction while she’s in the office. The physician administers an epinephrine injection and stays with the patient until she stabilizes. How should you code this? In this case, you’ll report the physician services in addition to any applicable injection code(s), such as 95115 (Professional services for allergen immunotherapy not including provision of allergenic extracts; single injection) or 95120 (Professional services for allergen immunotherapy in the office or institution of the prescribing physician or other qualified health care professional, including provision of allergenic extract; single injection). As in other situations when the provider renders an E/M service, such as established patient visit 99214 (Office or other outpatient visit for the evaluation and management of an established patient…), simultaneously with a procedure, modifier 25 (Significant, separately identifiable evaluation and management service by the same physician or other qualified health care professional on the same day of the procedure or other service) must be appended to 99214. Generally, the physician treats the patient with epinephrine (which you can bill using HCPCS supply code J0171) and reports the appropriate E/M service. Important: If your patient has a severe reaction and the practitioner spends a minimum of 30 minutes stabilizing the patient, you may document and report the critical care (99291-+99292) along with any other separately reportable services as necessary. In all cases, documentation should clearly explain the patient’s condition to justify reporting the additional E/M code(s). The physician is examining a COPD patient when the patient suddenly has a seizure and falls on the floor, where he hits his head. The doctor administers emergency care while waiting for an ambulance to take the patient to the hospital. How should you code this? In most situations, you’ll simply report a standard E/M code (99201-99215), provided the E/M service rendered and documented by the physician was appropriate for selecting that level of service based on the history, exam, and medical decision-making. The situation probably does not warrant critical care services (99291-+99292), and the emergency department codes (99281-99285) cannot be billed in the physician’s office. Alternative: If the provider subsequently sees the patient in the hospital and admits him later that same day, you should report only one E/M service per calendar day. Therefore, you’ll include any outpatient services in your initial hospital care with a code from the 99221-99223 (Initial hospital care, per day, for the evaluation and management of a patient …) range. F2F reminder: Remember, however, that to report the initial hospital service (99221-99223), the physician must provide a face-to-face encounter in the hospital setting. A physician sees a patient in the intensive care unit (ICU) of a hospital. He circles critical care code 99291 due to the location of the service. However, in this situation the patient doesn’t exhibit the three specifications of coding critical care. How do you code this? You cannot bill the critical care codes (99291, +99292) simply because the place of service is the ICU. Critical care is not based on the location of service, but instead, the term describes a type of care. Remember, these two codes must be in line with the aforementioned criteria, not the place of service. 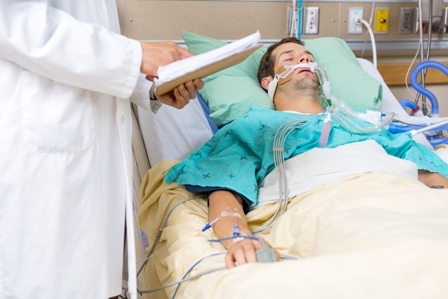 Better option: If the physician evaluates a patient in the ICU but does not perform critical care services, you’ll report an initial hospital care code such as 99221 or an appropriate subsequent hospital care code (99231-99233).